A few weeks back we looked at the biggest upsets in terms of world rankings positions in Rugby and Football. There was huge difference between how the minnows of football stand a chance against the big teams compared to Rugby. This is mostly due to the nature of the sports in that a game based on physicality is much more difficult to cause an upset. Today I am looking at the best teams in the world in each of the two sports. How does that compare over the last decade and more?. 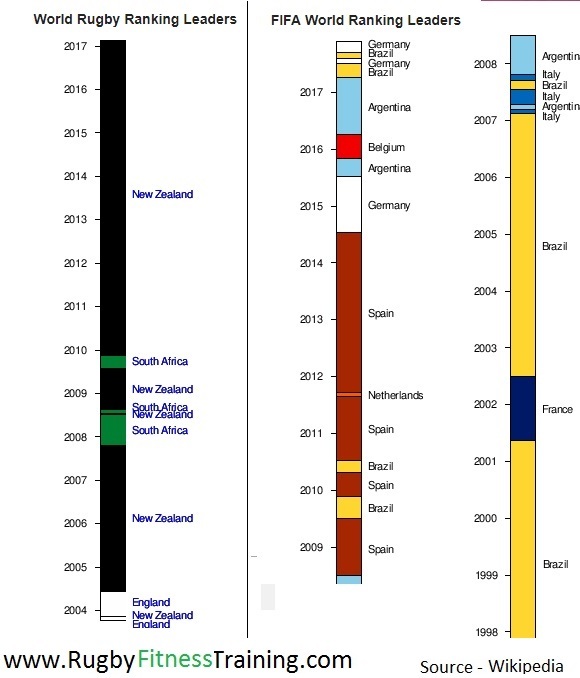 The number 1 position in Rugby has been held almost entirely by New Zealand for since 2004. In total only three teams have held the top spot since the start of the rankings in 2003. That being England, South African and the All Blacks. In football the rankings system which started in 1994 initially had a similar dominance to Rugby with Brazil almost exclusively at the number one spot for 13 years.This was soon followed by five years of Spain at number one. In total 8 teams have held the number one rankings position since 1994. That being Brazil, France, Argentina, Italy, Spain, Germany, Holland and Belgium. This shows that both sports are dominated by very few teams and that becoming the elite of the elite has some definite factors to it. These stats compare similarly to the Premier League where five sides have won it since 2003 or La Liga in Spain where four sides have won it. However, certain leagues are much more open such as Champions league in Football where nine sides have won it since 2003 or NFL (American Football) where eleven different teams have won the Superbowl since 2003.